If you are new to robotic exoskeletons, your ideas about them might be highly influenced by science fiction movies such as Iron Man, Aliens or Elysium. While the portrait of the technology in those movies may be a little over-the-top, resulting in unrealistic expectations, the main idea is not wrong. The exoskeleton enables the hero to solve a difficult task that he or she would otherwise not be able to solve (for example, defeating the alien queen), and this main motivation translates to today’s real world robotic exoskeletons. Robotic exoskeletons are basically wearable robots that resemble the shape of the human anatomy and, therefore, appear to be an outer (greek: exo) shell or skeleton. In contrast to their robot colleagues that assemble cars or clean our apartments, they are not developed to relieve us from a task by solving it autonomously, but rather to support us in executing a physical task that we cannot do independently. Support may be necessary for several reasons. Either, the tasks is too difficult for the average person, or someone is unable to execute an activity because of a physical impairment. In either case, the robotic exoskeleton provides the required physical assistance. Typical applications are industry jobs that require lifting and carrying heavy objects, rehabilitation of stroke patients or gait restoration in paraplegic users. The different exoskeleton designs are variable and depend strongly on the required level of support. Robotic exoskeletons consist of the same components as any ‘normal’ articulated robot. A rigid frame, joints and actuators enable movements. Sensors, electronics, computers and software are used to control the device. In addition, mechanical interfaces connect exoskeleton and user to transfer support. Additional sensor systems can be integrated to improve robot-user interaction by, for example, measuring biosignals from the user, which allows the exoskeleton to better anticipate the user’s intentions and react accordingly. 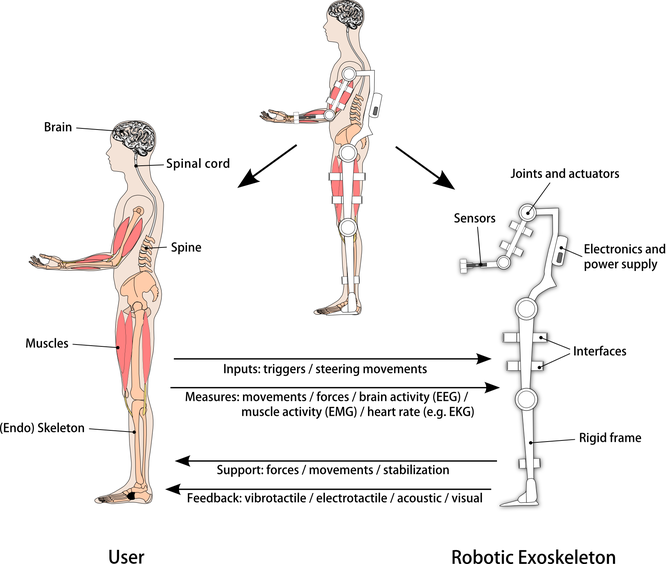 In the other direction, feedback systems such as sounds, blinking light or vibrations (similar to a mobile phone) can be used to inform the user about upcoming exoskeleton actions to improve usability. Although there are several examples of exoskeletons that are already commercially available (see, for example, our exoskeleton catalogue), the field is still very young and is far from reaching its full potential. Nevertheless, the field is growing quickly, more and more companies are establishing, and new exoskeleton products are coming to the market.